178 Marlborough is located on the south side of Marlborough, between Dartmouth and Exeter, with 176 Marlborough to the east and 180 Marlborough to the west. 178 Marlborough was designed by Cabot and Chandler, architects, and built in 1879 by Weston & Shepard, builders, for Richard Sullivan. He is shown as the owner of 178 Marlborough on the original building permit application, dated October 29, 1879. Richard Sullivan purchased the land for 178 Marlborough on January 13, 1880, from the heirs of James Lawrence. It was part of a larger parcel that James Lawrence and Thomas Jefferson Coolidge had purchased on May 15, 1872, from the Commonwealth of Massachusetts (James Lawrence purchased T. Jefferson Coolidge’s interest on December 28, 1872). Click here for an index to the deeds for 178 Marlborough. Richard Sullivan was a retired shipping merchant in the Calcutta trade. He and his wife, Henrietta (Gardiner) Sullivan, previously had lived at 395 Beacon. While 178 Marlborough was being built, they traveled to Europe, and Henrietta Sullivan died in Austria in September of 1880. 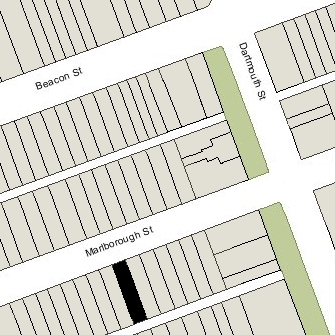 Richard Sullivan lived at 178 Marlborough upon his return, but had moved to 25 Mt. Vernon by 1882. On April 25, 1881, 178 Marlborough was purchased from Richard Sullivan by Mary Sarah (Sargent) Thomas, the widow of Arthur Malcolm Thomas, a trustee of estates, who had died in December of 1879. They had lived in Forest Hills before his death. She remarried in September of 1882 to John Vaughan Apthorp, a dealer in real estate and mortgages. After their marriage, they lived at 178 Marlborough. The Apthorps continued to live there during the 1890-1891 winter season, but moved thereafter and by the 1892-1893 season were living at 321 Dartmouth. On January 12, 1891, 178 Marlborough was purchased from Mary Apthorp by Georgiana Parker (Miller) Johnson, the wife of Edward Johnson. They also maintained a home, The Homestead, in Belfast, Maine. Edward Johnson was a railroad contractor and financier, a later a banker in Belfast, Maine. On February 10, 1897, Georgiana Johnson transferred 178 Marlborough into her husband’s name. Edward Johnson died in January of 1906. Georgiana Johnson continued to live at 178 Marlborough until her death in August of 1907. During the 1907-1908 winter season, 178 Marlborough was the home of cotton broker and manufacturer Charles Bean Amory and his wife Lillie (Clapp) Amory. They had lived at 170 Marlborough in 1907. They also maintained a home in Milton, which was their year-round residence in 1909 (by 1910, they had established their Boston residence at the Hotel Agassiz at 191 Commonwealth). During the 1908-1909 winter season, 178 Marlborough was the home of Alfred Dwight Foster and his wife, Evelyn Margaret (Samborne) Foster. Their primary residence was in Milton. A lawyer by training, he was president of the New England Mutual Life Insurance Company. By the 1909-1910 winter season, 178 Marlborough was the home of Emma Fields (Glidden) Gardiner, widow of Charles Perkins Gardiner, a trustee, who had died in August of 1908. Living with her were their daughter, Mary Caroline (Gardiner) Cabot, widow of architect William Robinson Cabot, and the Cabots’ two daughters, Mary Geraldine Cabot and Caroline Elizabeth Perkins Cabot. They continued to live there during the 1911-1912 season, but moved soon thereafter. On June 13, 1913, 178 Marlborough was purchased from Edward Johnson’s estate by Kate (Hunter) Dunn, the wife of retired shipping merchant Thomas Dunn. The also maintained a home in Newport. Their children, Dr. Charles Hunter Dunn, a physician, and Anna Caroline Rotch Dunn, lived with them. 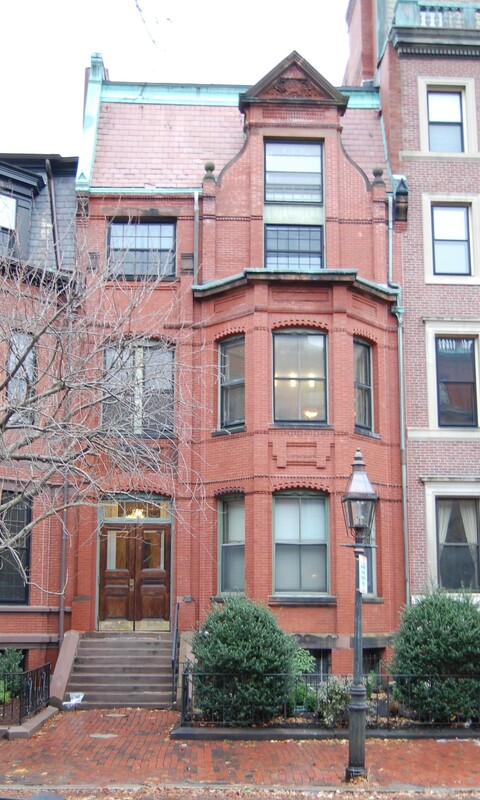 Dr. Dunn also maintained his medical office at 178 Marlborough. He previously had lived in an apartment at 220 Marlborough, where he also had maintained his office. Their other son, Robert Steed Dunn, lived in Newport; he was a journalist, explorer, naval officer, and author. Thomas Dunn died in May of 1916. 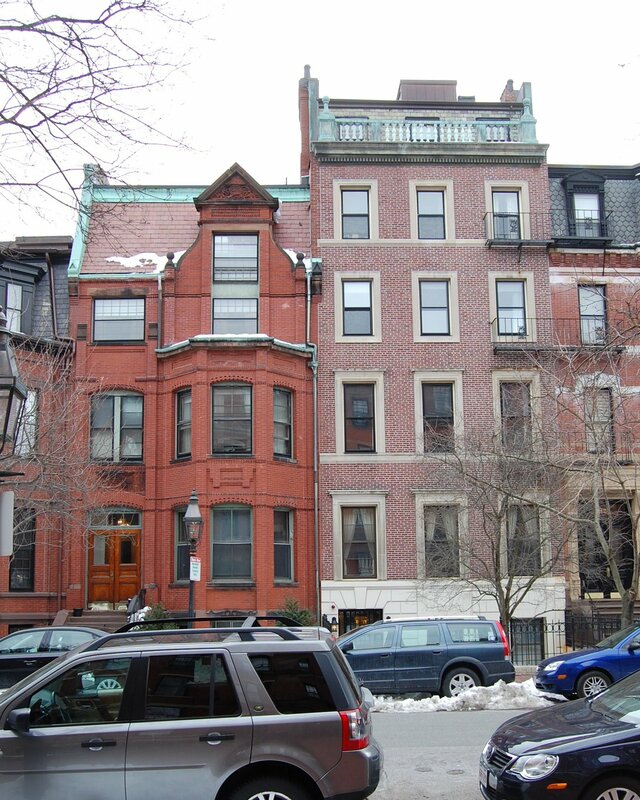 Kate Dunn, George Dunn, and Anna Dunn continued to live at 178 Marlborough until about 1923. They subsequently moved to Katonah, New York, where they were living at the time of her death in July of 1930. On April 12, 1923, 178 Marlborough was purchased from Kate Dunn by Belle (Hadley) Smith, the wife of Dr. Otis Shaw Smith, a dentist. In June of 1923, Otis Smith filed for (and subsequently received) permission to convert the property from a single-family dwelling into a doctor’s office and dwelling. As part of the remodeling, he enlarged the windows in the rear bay on the first and second floors, and also enlarged the third floor rear window. In 1925, and probably later, the Smiths leased office space to several other dentists, all of whom lived elsewhere. On October 29, 1937, Belle Smith transferred the property into both of their names. Belle Smith died in November of 1964. Otis Smith continued to live and maintain his dental practice at 178 Marlborough until his death in April of 1968. On December 9, 1968, 178 Marlborough was purchased from Otis Smith’s estate by Rev. George Nichols Marshall. He was director of the Church of the Larger Fellowship, a Unitarian Universalist congregation formed through correspondence, with no physical church location. He also owned 174 Marlborough and lived in an apartment there. 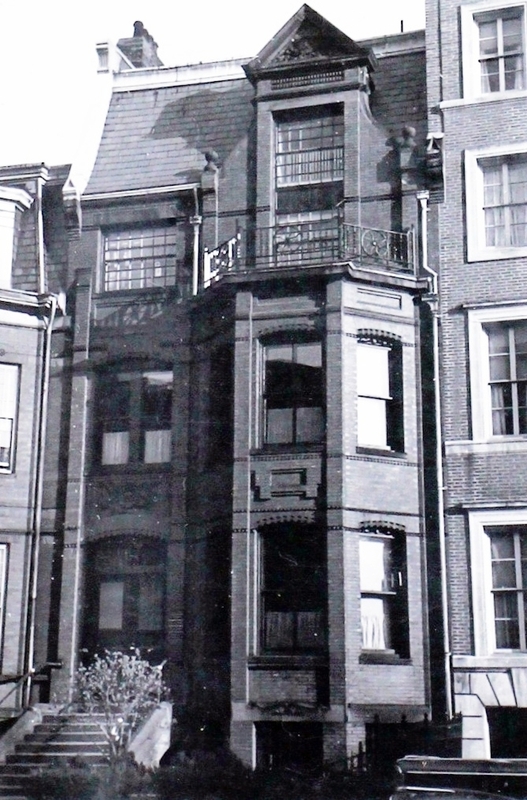 In January of 1969, he filed for (and subsequently received) permission to convert 178 Marlborough from a doctor’s office and residence into seven apartments. On January 2, 1973, 178 Marlborough was purchased from George N. Marshall by Lewis A. Sassoon and his wife, Marcia F. Sassoon. The Sassoons separated in the mid-1980s and on March 12, 1987, they transferred 191 Marlborough into his name. On November 12, 1987, he transferred the property to himself as trustee of the Triple S. Trust. 178 Marlborough remained an apartment house in 2016.